Which of the following is NOT a true statement about the Bible? Who had eighty-four converts during a revival? Brother Branham really got joy out of listening to their preaching and singing. What do you do if you want somebody to say nice words about you? If Brother Branham couldn’t answer the questions, what was Brother Neville going to do? What does it mean, the Scriptures are of no private interpretation? _______ never was a person that liked to stay too long in one place. "Jesus, by ___ _______, perfected, forever, His Church." God calls who He will. And it's all by ________. What two words do you have to watch? If you don’t, you’ll get mixed up. When God once speaks, It’s forever. If God ever saved a man, he is saved for time and Eternity. After he become an enemy to God, he was still saved? ______is what God did for me, _______is what I do for God. A Christian cannot blaspheme the Holy Ghost. Who was Brother Branham praying for in his cave at Green's Mill? "But I say unto you, Love your enemies, bless them that curse you, and do good to them that hate you, and pray for them that despitefully use you, and persecute you;"
You’re still a cocklebur if you _______. _______ companies doubt. _______ companies faith. Mr. Ramsey told everyone that he wasn’t serving the Lord anymore, and wouldn’t listen to the ones who tried to talk to him. He took sick and died. What did this show? Here are the current quiz results for Hebrews, Chapter Six #2. 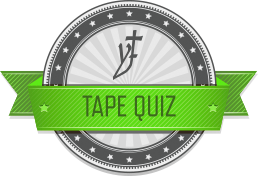 Anyone taking the quiz after Sunday, October 26, 2014 will not have their score posted.